Species Profile: The Ninja Lanternshark - We Love Sharks! Species Profile: The Ninja Lanternshark - We Love Sharks! When four children, from ages 8 to 14, were asked what they’d name a recently discovered black shark that glows, they cleverly dubbed it ‘Super Ninja Lanternshark.’ Well, it’s not hard to see why they would call it that. First of all, the newly discovered fish was black as night and stealthy: it also glowed. Remember that Japanese ninjas are notoriously dressed, head to toe in black. Also, Ninjas are stealthy, just like this shark. In addition, Lantern refers to light, and this shark glows. The word ‘super’ was dropped leaving the name Ninja LanternShark. We’d say these youngsters did a phenomenal job giving this shark species a clever, appropriate title. The Ninja lanternshark’s Latin name is Etmopterus benchleyi. It is named after Peter Benchley. Mr. Benchley was the shark-loving novel author who wrote “Jaws” and also co-authored the film adaptation by Steven Spielberg in 1975. 3. Physical Characteristics Of The Ninja Lanternshark. This shark is pitch black. It has white markings around its mouth and eyes with a dense concentration of dermal denticles around its eyes and gill openings. The shaping of the mouth makes it appear like it’s sporting a tiny frown. The male grows to about 32.5 cm (12.8 in) and the female 51.5 cm (20.3 in), as a result of this, it’s not in the group of larger sharks. This is a deep sea shark. Most deep sea sharks are colored dark brown or black to allow them to blend in with the darkness of the depths. Because they are black, Ninja Lanternsharks can hide extremely well with the dark, deep water surroundings. Usually, this kind of feature works as a defense mechanism against predators, making themselves almost invisible. However, some species, like the lanternsharks, sport bioluminescent organs (photophores) that produce a shining pale green light. Most likely, this ability to glow may allow them to attract mates, or to mask their shadows, so they’re not visible to predatory fish below them. Glowing could also enable them to maintain group cohesion when swimming. In addition, the light emitted likely lures smaller invertebrates to come within snapping range of their mouths. There are some differences between the Ninja lanternshark and other lanternsharks. The major difference is that while the Ninja lantershark has its photophores on its head, other lantersharks have theirs on their bellies. Apparently, its small size would mean this shark would hunt smaller prey like shrimp and small fish. The lower jaw has between 30 and 36 teeth. The top teeth look like they are more for grasping while the bottom teeth do the cutting. Because of its pitch black coloring it can sneak up on its prey without them noticing the danger until it’s too late. By doing this, it easily makes up for its small size. This species was discovered off the Pacific Coast of Central America. A small group of marine biologists led by Vicky Vasquez from the Pacific Shark Research Center captured eight of these previously unknown sharks. The fish were swimming at ocean depths of between 2,624 ft. (800 m) to 4,720 ft. (1,440 m). They appear to thrive from Nicaragua on to Panama and Costa Rica. The Ninja Lanternshark isn’t the first luminescent shark discovered. Actually, forty other known species exist, and they are known simply as lanternsharks. Despite that, this is one is pitch black and the only Etmopterus species known to dwell in the Pacific coast of Central America. In conclusion, ‘Lost Shark’ research has become trendy in the past 20 ten years. In fact, approximately 20% of shark species were discovered in that period alone. The bigger, majestic and more popular shark species are actually a very small percentage of all the world’s sharks. Rather, many of the newer discoveries are smaller specials, like the Ninja Lanternshark. As a result, researchers continue to seek out new species as funding allows. 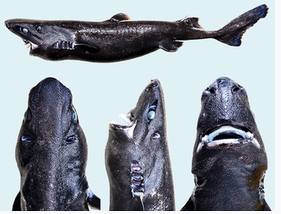 Surely, the recently discovered Ninja Lanternshark is one of those rare gems.